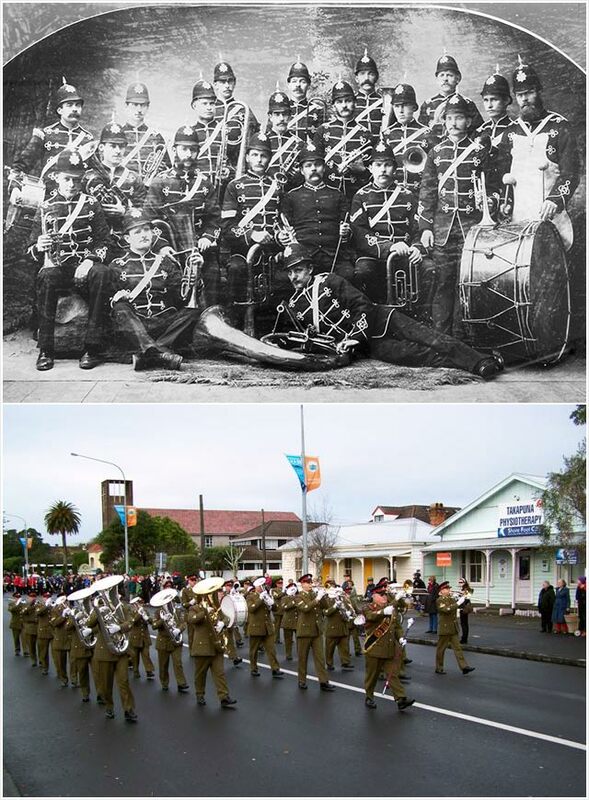 The Band of the Royal Regiment of New Zealand Artillery is shown in 1885 in its oldest surviving photo (top), and marching through Takapuna, Auckland (bottom). The band has its origins in the New Zealand wars of the mid-19th century. Men of the 58th Rutland Regiment, which had arrived in New Zealand in 1845, were eventually discharged in Auckland and some joined the band of the Auckland Volunteer Rifles, formed in 1858. From this earlier band the Artillery Band emerged in 1864. In its long history, the band has always had close links with Auckland.